Smart security is taking off in a big way, especially as so many homes now own a smart hub. Wireless door, window, motion and presence sensors allow homeowners to be alerted on a mobile device in the event of anything untoward occurring, as well as triggering useful events, such as the switching on of lights and heating ahead of arriving home. Let’s take a look at some of the ways in which smart sensors are being used to safeguard the homes of today. Smart window and door sensors can detect when doors and windows have been opened. They are simple to fit, easy to use and provide instant peace of mind. Door and window sensors are less likely to be triggered by pets or billowing curtains than a regular motion sensor. Formed of two parts, the first is attached to the door or window, whilst the other is attached to the frame. When the door or window is closed, the circuit is complete, and so considered ‘closed’. Once the door or window is opened, the circuit is broken, and so an alert is triggered. You’ll need a smart home hub to operate from, such as the British Gas Hive. You can usually buy packs of sensors to cover multiple windows and doors. Just think of which doors and windows are most vulnerable and focus on those. Final exit doors (back and front) and accessible windows, such as those on the ground floor or located over flat roofs, are most at risk. To set up, just install batteries (usually lithium), install the app on your smartphone or tablet, check the sensor is registering, choose a location name and then attach the two parts of the sensor to the two parts of the window or door. Now you will receive alerts when doors or windows are open, or you can consult the app to check all your doors and windows are safely shut before you leave home. Motion sensors are like a virtual security guard for your home. They are easy to install and even easier to use. You’ll need to be prepared for the possibility of false alarms (although now fairly rare thanks to advances in technology), and be very careful when siting. Motion sensors use infrared technology to detect movement within a set space, triggering an alert when anything is sensed. Most of them are adjustable sensitivity wise, so if you are getting false alarms then you will be able to make changes to prevent it triggering next time. On detecting movement, the motion sensor sends a notification to your smartphone or tablet. You’ll need to pair it with a compatible smart home hub. Again it’s easy to set up, just add batteries, register the device and its location using the app then situate in a suitable location. There are usually adhesive pads included, or it can be placed freestanding. The beauty of the smart motion sensor is its versatility. Use it to trigger other actions that are set up on your smart home hub, such as switching on lights when motion is detected. Some motion sensors, such as the Eve Systems range that works alongside the Apple HomeKit, go a step further to trigger a whole train of events such as the switching on of lights and heating when you get home. Others, such as the Fibaro Motion Sensor, can be set to switch lights on or off automatically by detecting the amount of ambient light in a room. 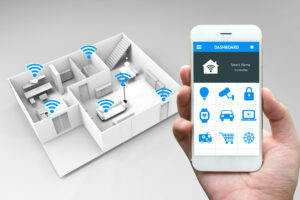 Presence sensors are one of the most sophisticated smart home security devices available today. They are different from motion sensors in that they indicate whether something or someone is at a set location, rather than detecting movement. These are key fobs that you attach to or place inside loved one’s belongings. They then have it trigger an alert every time they leave or arrive home. These sensors can be used to trigger customised events, such as automatically switching on the lights when you approach your home. They are also beneficial for keeping track of pets or even loved ones who tend to wander from home. Examples include the Samsung SmartThings Presence Sensor, compatible with iOS and Android devices. Check the detection range and angle of detection before making your purchase: some devices offer greater ranges than others. Ready to go smart with your home security? At Barry Bros Security, we may have been around since the 1940s, but we have by no means stood still when it comes to technological advancements and the evolution of security solutions. If you are looking to go smart with your home security, why not talk to one of our experts today? We’re here to advise you on all the latest home security revolutions.